A chocolate delight is what you will receive in this shave soap. One of a kind soap that will enhance your life. Van Yulay has made a shaving soap that is luxurious with butters of Kokum & Cocoa that give the shaving experience over the top. 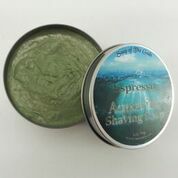 Shaving with quality clay of Kaolin with give you that glide in your BBS shave. · Calendula is used to disinfect minor wounds and to treat infections of the skin. The antibacterial and immunostimulant properties of the plant make it extremely useful in treating slow-healing cuts and cuts in people who have compromised immune systems. The herb stimulates the production of collagen at wound sites and minimizes scarring. Natural moisturizer with powerful emollients and protective properties. Kokum Butter – has been used traditionally in India for hundreds of years to soften skin and restore elasticity and as a balm for dry, cracked, rough, and calloused skin. Made with Stearic Acid, Aloe Vera,Coconut Fatty Acid, Palm Stearic, Glycerin, Potassium Hydroxide, Coconut-Castor-Tallow-Emu-Olive-Argan-Oils, Cocoa Butter, Extracts, Poly Quats, Glycerin, Sodium Lactate, Allantoin, Silica, Liquid Silk, Cocoa Powder, Bentonite Clay, and Fragrance.